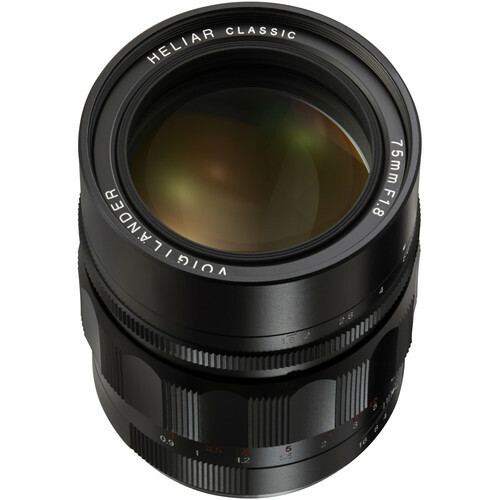 A fast prime for M-mount rangefinder cameras, the Heliar 75mm f/1.8 from Voigtlander blends a bright maximum aperture with a short telephoto focal length to realize an ideal lens for portraiture. The slight visual compression of the focal length is complemented by the depth of field control afforded by the f/1.8 maximum aperture, and the lens's manual focus design permits working with subjects as close as 3' away. Also, a 10-blade diaphragm contributes to a smooth bokeh quality for more aesthetic out-of-focus backgrounds. Bright f/1.8 maximum aperture is well-suited to working in low-light conditions, and also benefits using selective focus techniques. A 10-blade diaphragm contributes to a smooth bokeh quality to suit shallow depth of field imagery. Manual focus design permits working with subjects as close as 3' away. Reversible lens hood is included to help reduce lens flare and ghosting. Box Dimensions (LxWxH) 7.8 x 4.6 x 4.5"
Heliar 75mm f/1.8 Lens is rated 4.8 out of 5 by 10. Rated 4 out of 5 by Andy from Great with the Sony A7 I bought a Sony A7 from B&H and needed a good fast portrait lens. There are very few good native lenses available currently for the A7. Leica M/ Sony E mount adapters make alternative lenses so easy to use and give a A7 user great alternatives. Being someone who began his photography days with film and manual focus I didn't hesitate trying this lens. With the focus peaking on the A7, manually focusing this lens is a breeze. Beautiful bokeh. The lens is very small but has some weight to it with its metal construction. This Voigtlander lens is SO easy to use with the A7, I will likely get the 50mm 1.5 Nokton instead of the Sony/Zeiss 55 1.8 FE lens. Rated 5 out of 5 by Retro-Grouch from The perfect portrait lens This lens is quite sharp, but without the excessive contrast so common in most contemporary lenses. Like so many of the Cosina-made Voigtlander and Zeiss lenses, it has more of the look of classic German glass from the 50's and 60's, with more open shadows and better tonal transitions, exactly what most shooters want in pictures of people. The lens is a little soft on the edges when wide open, but when the emphasis is on a central subject, this can actually be a positive effect. This is a BIG lens to put on a rangefinder, and a bit awkward to handle, but compared to SLR lenses of this focal length, it's still relatively compact. Construction is superb, which is a given with all V/C lenses. Highly recommended! Rated 5 out of 5 by William from Phenomenal! Recently, we compared four 75mm rangefinder lenses: 1) Leica Summilux-M 75/1.4 Ver2, Canada ($$$$) 2) Leica APO-Summicron-M 75/2 ASPH ($$$) 3) Leica Summarit-M 75/2.5: cf., 75/2.4 new ($$) 4) Voigtlnder Heliar 75/1.8 ($) The Voigtlnder had the second-best blur (after the Summilux) and was among the easiest to focus. Being least expensive didn't hurt, either. Its character is two-fold: old-style portrait-look wide open, and modern sharpness when stopped down a little or a lot. Highly recommended. Rated 5 out of 5 by Homer from Excellent M lens alternative I previously owned the enormously expensive, Leica M 75 mm f 1.4. However, with one hand paralyzed by a stroke, I had trouble using the maximum aperture due to the limited depth of field. Since the Leica M 75 mm f 2.5, which is still extremely expensive, is admitted by Leica to be a compromise, I bought the Voightlander 75 mm f 1.8. Photographing at f 1.8 and f 2.8 or so with my M 9, I found the renditions in my first trials quite acceptably on a par with my other, older Leica M lenses. Pehaps I have gotten used to manual focusing with my disability, but I also found this lens to yield smooth gradation, very nice sharpness, and indeed to be perfect for me as a portrait lens. It also has a classic build quality which far exceeds most consumer DSLR lenses. I guess a real test would be side-by-side with a Leica M 75 mm, but frankly the Voightlander gives me what I want.......and I have been a serious amateur for about 45 years and am picky! Rated 5 out of 5 by kamerkorner from Fantastic lens I actually use this lens on a Voigtlander Rangefinder (the R2A). I have used this lens for both Color and Black and White film. Everything from landscapes to city streets as well as portrait. The bokeh is good. This lens is also a fast lens and can be used in low light situations. The lens is a little large for the premise of street photography (small and fast). But, I found that it works well and not too large. I coupled this lens with the 28mm which I find to be a great pairing for my tastes. The lens feels solid and great to the touch. I love using the R2A because of the Automatic mode. One less thing to think about when taking photos. I would recommend this for the R2A/M and R3A/M Voigtlander Rangefinders. The R4A/M does not have the brightlines available for this lens. Rated 5 out of 5 by Ron from A pleasant surprise Quite surprised by how much I like this lens. This is the first Voigtlander lens I've added to my collection for use with my M. The focus action is excellent, smooth, quick. While many seem to prefer focusing tabs, I much prefer the knurled focus ring which is quite easy to be accurate with. Build quality is extremely good. Aperture clicks are quick positive. On the downside its quite hefty, though it must be said that the weight does impart sense that it is a lens built to last. Weighs in a couple of ounces more than the Elmarit 90mm. Considering the cost of other M lenses at this focal length, its quite a bargain. With the exception of a Summicron 50mm, all my Leica glass is a minimum of 20 years old. I personally prefer the character of the older lenses. In that regard this lens fits right in. A tick more contrast perhaps, but still a more film like look than the ultra clinical look of the 75 Summicron. If the latter is more your style you'll almost certainly be disappointed by the Heliar, but if. like me, you lust after a Summilux, this piece does a credible job as a stand in until the day comes that I swallow hard and finally pony up for one. Rated 5 out of 5 by Gregory from Vintage style from the zeiss factory. The look feel and build quality of this lens are all top of the line. It comes with a metal lens hood. I enjoy vintage glass on modern HR digital bodies. Though not vintage, this lens fits with my photography style perfectly. It's easy to nail focus with the manual assist features in modern cameras. I actually find it easier to focus on what I want than an AF which might land anywhere in the frame. Obviously that's not including the more cutting edge AF techs. Anyway, this is a great portrait and medium focal lens in general. Rated 5 out of 5 by JOHN G. from Excellent lens I'm a portrait photographer and while the Leica rangefinder isn't my first choice for portraits, I wanted a portrait lens for it. This fills the bill well. It's very sharp, I'm not a tester and don't photograph charts, but it's a great lens. Is it the Voigtlander Heliar Classic or is it a different version of the 75mm f1.8? Yes, this is the Heliar Classic. Can i use this lens with my Nikon D750? This lens will not focus to infinity, even if you find a F to M converter . (I've never seen one, BTW) The lens on a Leica-M mount camera is much closer to the film plane, due to the lack of a mirror box (these are made as rangefinder lenses, after all) in the Leicas. Will this lens work on the Fuji xt2? Not without having the Leica adapter that Fuji makes. I think it costs about $200 to get the adapter. What is t5he difference between an M mount and VM mount? Voigtlander uses the term VM mount to refer to M mount. Can I use this lens for video in my GH5? You should be able to use it on your gh5 but since the gh5 is a m4/3 camera this lens would act like a 100mm lens because m4/3 has a 2.0x crop factor. you would just need to buy a leica m mount to m4/3 adapter. Answered by: Mari Carlin D.
Does it come with a lens hood? Hi, yes, the he liar 75mm lens comes with a lens hood designed to be used with rangefinder cameras. the lens hood protects the glass but allows you to see through it when looking through the rangefinder. Is this lens rangefinder coupled with the leica m camera? Yes, it works with Leica M10 for me. 90% of Leica equivalent quality for less than 10% the cost.